Expressive lines with thick and thin. Often a beginning artist will draw, holding his pencil like he would to sign his name, with the point downward. This is how most of us hold any kind of pen or pencil. But to begin getting more interesting and evocative drawings you need to change your grip. 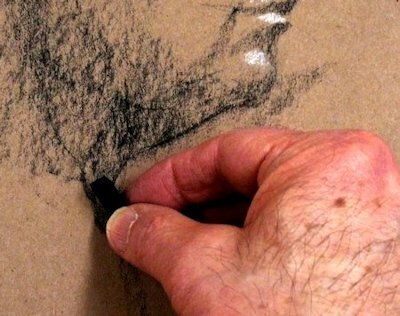 Instead of holding the pencil or pastel or charcoal point down, begin to hold it point up. This allows you to get more expressive, because you have to move both your hand and your arm. 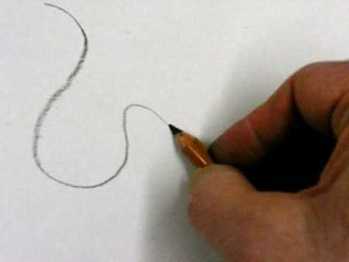 Drawing this way takes some practice to gain eye-hand coordination. But doing so helps you draw wonderfully varied, flowing lines. It allows you to use the length of the lead to create wide (thick) lines or the edge or point to create narrow (thin) lines. 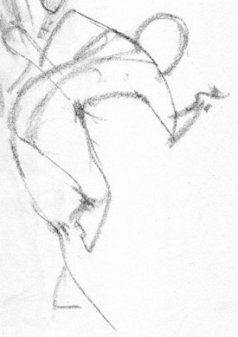 Look at this simple gesture drawing. A gesture drawing is usually a one or two-minute warm-up exercise in quickly capturing the essence of the thing you are drawing. See how thick and thin lines make this drawing more visually interesting. I am doing the same thing in the drawing below, but here I am using a square stick of pastel. I can sweep the pastel to the side laying down a wide swath of tone or use its edge to create thick or thin lines. You can see the many thick and thin lines in this drawing better in the photo below. 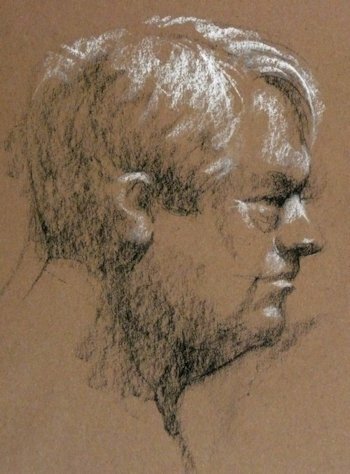 Notice how, especially in the hair, I start with a wide swath and then use the edge of the pastel to taper the line. These lines are just one continuous stroke. If I held the pencil or pastel with the point down, like I would to write my name, I couldn't do that. Also, when your hand rests on the surface on which you are drawing your freedom of movement is restricted. Restricted motion inhibits how expressive you can be. Plus, you always face the danger of smearing what you've already drawn. Set your drawing hand free and let it create those wonderful thick and thin lines that add excitement to your work. P.S. As I mentioned, drawing this way takes practice, but it vastly increases what you can do in a drawing and it allows you to do it more quickly. For me, at least, doing things more quickly gets more important the older I get. I find the older I get, the shorter my attention span. I simply don't have the patience to labor over a piece of art; plus artwork very often looks more exciting when it is loose and free. Give thick and thin a try and let me know what you think.